One of the most important decisions that needs to be made concerning your kitchen is choosing a kitchen work surface. The reason this decision is so important is that your work surface is something you will use every day. There are many different types of work surfaces on the market and choosing the right one for you and your kitchen is a personal choice. When choosing a kitchen work surface you must consider how you will use the area and which type will enhance the beauty of your kitchen. For instance, if you want a low-maintenance countertop you may want to avoid stone countertops because they need to be sealed at least periodically to retain their beauty. If you love to cook you might want to choose the most heat-resistant type of materials. If hygiene is a high priority you may want to consider an anti-bacterial material such as Corian. Let us look at some of the different types of work surfaces and what each of them has to offer. When choosing a kitchen work surface many people choose hardwood surfaces such as maple or oak. For most people the durability and natural beauty of hardwood appeals to them. Hardwood work surfaces are best used in food preparation and dining areas such as islands and breakfast bars. Hardwood countertops look great, and can be used in any type or style of kitchen. Wood adds a warm and inviting air to your kitchen. Hardwood work surfaces require some maintenance, spills should be cleaned immediately to avoid stains. Although wood can be sealed to better protect the surface from stains. If wood is scratched, the scratches can be sanded out allowing you to keep your work surface looking great for many years. Hardwood countertops are durable, but they can be scratched by knives and damaged by hot pans. It is best to use a cutting board, and to ensure hot pans are kept off the surface. Composite work surfaces are fast becoming one of the top choices for those that are choosing a kitchen work surface. Composite is a practical choice for a countertop that is also very beautiful. They can be purchased in a variety of colours and can be used anywhere in the kitchen, even next to the stove. The upkeep of composite countertops is simple, wipe clean with a damp cloth and mild detergent. Composite work surfaces do not need to be sealed. This type of countertop is one of the most durable on the market, they are even more durable than most stone countertops. Like wood, scratches can be sanded out as the color runs throughout the material. This continues to be a top choice among those choosing a kitchen work surface. Granite is a beautiful material, and that is the reason it remains popular. Granite can also be used anywhere in the kitchen, around the sink, the stove, and even as an island countertop. 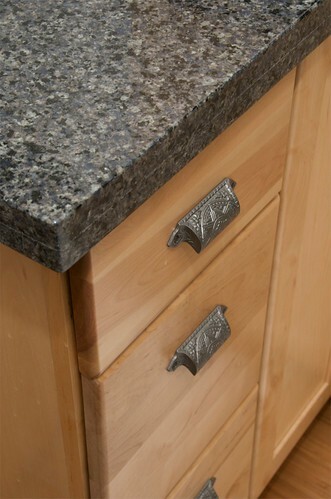 If properly sealed granite is a low-maintenance material. All that is required for cleaning is a damp cloth and a mild detergent, granite should be sealed periodically. Granite is very durable and can withstand water and high heat, this is a great material for those that love to cook and use their kitchen a lot. 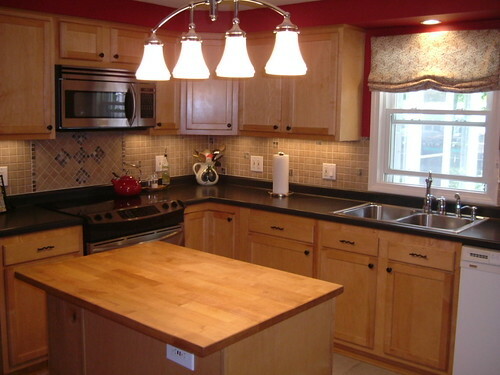 The main drawback of granite, and other types of stone, is that they are very heavy countertops. When choosing a kitchen work surface laminate countertops are a good general purpose choice. They can be used in food preparation areas, around the sink, stove, and islands. Since laminate work surfaces can be made to look like stone, wood, or other surfaces they can be used in any type of kitchen with any type of décor. Laminate countertops do not need to be sealed, and can be cleaned with a damp cloth and mild detergent. They are very resistant to most stains and chemicals, but they can be damaged by heat. Laminate work surfaces are so durable they are one of the few that can be used as a cutting board. Another benefit of laminate is that the material is easy to work with, most homeowners can easily install this material on their own. While many people love the look of glass countertops in their kitchen, they are not the best choice for those that use their kitchen for cooking. Glass can be used effectively around sinks, and as the top for an island. Glass is also useful in small kitchens, since glass is reflective it can make a small kitchen appear to be bigger. One of the best benefits of glass is that it can be lit from underneath giving your kitchen a beautiful and unique look. Glass work surfaces do not need to be sealed but they need cleaned frequently to remain sparkling. Modern methods of treating glass makes it more durable, and it is heat-resistant, but glass is prone do scratches, and dulling over time. When choosing a kitchen work surface these are the most common choice for most homeowners. There are several others to choose from including Corian and Stainless-steel, which are both great for those that require a hygienic work area. Choosing a kitchen work surface can be a tricky decision at the best of times; with so many material and colour choices it can often we hard to narrow down your options. Discount Granite Direct unsurprisingly specialise in granite worktops for kitchens but also highly recommend then use of other hard wearing materials such as Quartz or Marble.